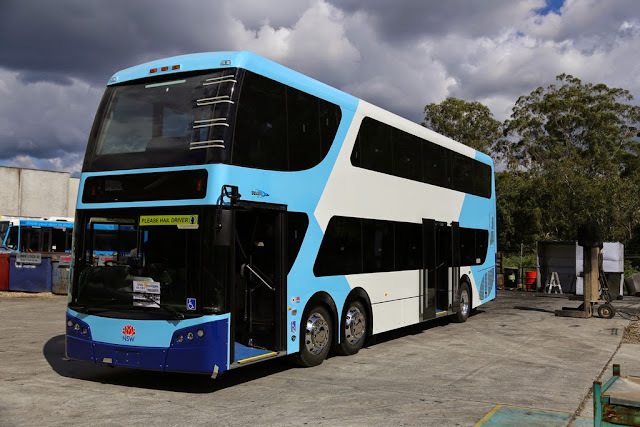 Bustech, part of Transit Australia Group, has partnered with the Malaysia Automotive Institute (MAI) (a Malaysian government body), Swinburne University of Technology and AutoCRC and a private Malaysian company to develop and test the E-Bus project in Malaysia. The earlier model of the bustech bus A 12.5 metre double decker bus. 12.5m Ultra low floor with one forward entry door and one side exit, both 1250mm wide Giving it a Seating Capacity of 96, with two wheelchair positions provide by 6 flip up seat’s and a standing capacity of up to 20 dependant on final specification. Integrated body and chassis all 304 Marine grade stainless steel fully welded with alloy and composite flooring and other light weight components gives it a tare weight of approximately 13,000kg. With a fully loaded weight of approximately 20,540kg with 116 passengers falling well within the 21,000kg GVM. In which the cummins engine ISLe5 in line 6 cylinder Euro 5 compliant with SCR Tech is used with 6 speeed ZF Gear box system or voith 4 speed and good suspension provided by bustech active ride system, where as the Wabco systems incorporating the ABS.